It sounds simple enough but this important fact seems to loose itself on those that are new to Dynamic Actions. Even when this fact is understood, developers may still have trouble getting the false actions to fire because they can't think of a condition that will work for their situation. The key lies in understanding conditions and how flexible they can be. 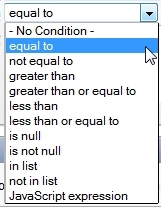 If you select "- No Condition -", guess what, NO FALSE ACTIONS! 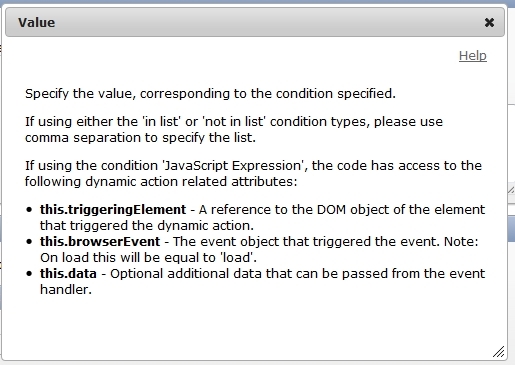 At that point only the event matters - in our current example that's the change event on the item P1_HIDE_SHOW. 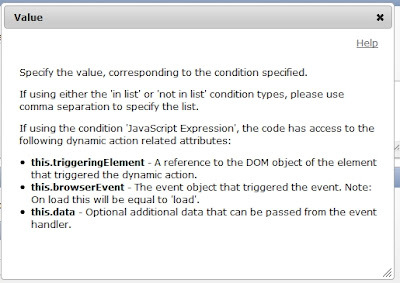 The Dynamic Action framework does a good job of making this point obvious by hiding the false actions when there is no condition but I wanted to make sure to remind readers of this fact here. I could have simply hard coded the id for the first element but I wanted to show how one could use this.triggeringElement as it's more flexible - imagine using it in a tabular form where there are many checkboxes with "random" ids.